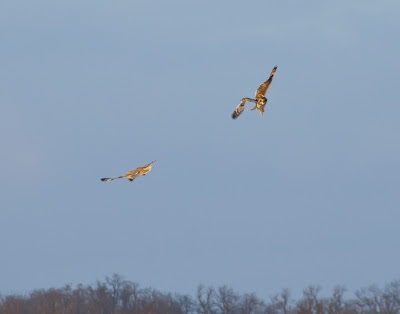 These are a couple shots from a couple weeks ago of some Northern Harriers I saw flying around our field. They didn't start their acrobatics (or should that be "aero"-batics) until I had already exited the field and was walking home via the road. Therefore, I was quite a ways away from them. I still enjoyed taking the photos and watching them. These birds are very entertaining to watch. This one was looking right at me. It had just caught a mouse and has it in its talons. These two were swooping at each other. It was as if they were playing "Tag"
or possibly dancing in the air. Sorry the pictures aren't the best. Sometimes, the photos don't turn out as great as the experience, I guess. Lovely shots of beautiful birds. We are ready for spring too! Wow, he certainly was looking straight at you! I clicked on it to get a better look - what a face! I love the first one Misty with the sun glistening on the wings and that cute face! Wonderful and exciting action shots, especially that "sidelong glance"! Great shots of the Harriers. You really caught the action. The photos turned out quite nice... better than I could have really have done, really! I am ready for spring as well. It is quite cold here and I'm ready to shed the parkas and mittens. Wonderful photos to me! The experience is something else -- you are right! Wonderful! That is very lovely take. Thanks for sharing! I sure enjoyed watching the harriers when I lived in the country. Don't see many in town. Great photos, Misty. That's beautiful, I haven't had any luck capturing birds that are in motion. Love the one with the owl looking right at the camera! Amazing! Wonderful "in flight" shots Misty!! Great shots! Always exciting to see something special like that and the one of bird looking right at you is really good. I think the experiences are always better than the photographs. Still, I enjoyed the poses of your birds and hearing about what you saw. I love your SkyWatch photo, by the way. It is artistic the way it is laid out, the colors and all. Plus, it's pleasing to the eye. I'm ready for spring, too. I would love to watch the harriers! Great captures! What gorgeous birds. I bet it was fun watching them! And I like the transparent header image. Looks good! Even though your photos aren't close up, one can appreciate these magnificent birds. These are awesome photos!! I'm in North Florida, and although the weather is warmer here than where you are...you would still need a coat! It snowed in Ocala!! Great shots, Misty. I love the one where it is looking at you. 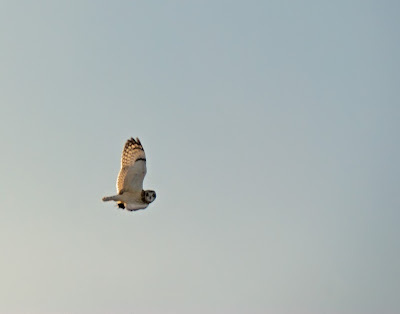 My field guide has that the juveniles have a facial disc as in owls. And it looks like an owl face in your first photo. I had to keep looking at it to make sure it wasn't an owl. They are quite owl-like. Nice pictures. We just get little birds in our 'hood. Great action shots of Northern Harriers. So enjoyable to watch the birds. How awesome Misty! I love how he's looking at you in the first one!! Wow, that is so amazing that you got such a great pic of his face! Awesome!